Bellator 163: McGeary vs Davis Weigh-In Results (photos) » MMA H.E.A.T. The official weigh-in for “Bellator 163: McGeary vs. Davis” took place this evening inside of the Mohegan Sun in Uncasville, Conn., and the competitors are now ready for action LIVE and FREE tomorrow on SPIKE at 9 p.m. ET/8 p.m. CT. 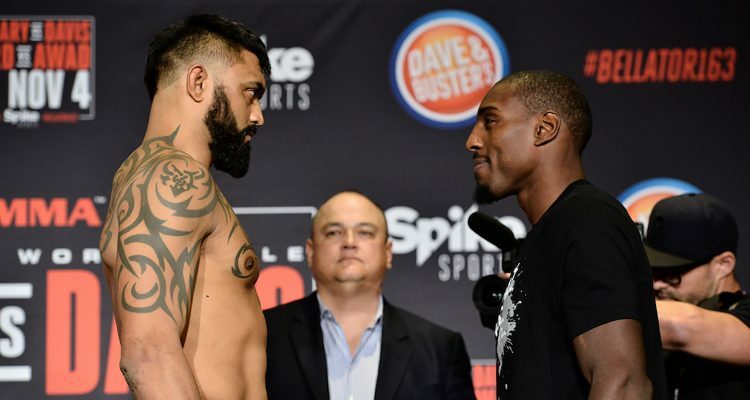 The “Bellator 163: McGeary vs. Davis” main card is highlighted by a light heavyweight world title fight pitting current division champion Liam McGeary (11-0) against Phil “Mr. Wonderful” Davis (16-3) and a welterweight co-main clash between Connecticut’s own Brennan Ward (13-4) and Saad Awad (19-8). In addition, a welterweight showdown pitting Paul “Semtex” Daley (38-14-2) against Derek “The Barbaric” Anderson (14-2) and a heavyweight bout featuring Sergei Kharitonov (23-5) against Javy “Eye Candy” Ayala (9-5) will also be featured on the SPIKE-televised event. The Bellator.com-streamed preliminary portion of the event is headlined by the highly anticipated professional debut of blue chip prospects Ed Ruth and Tyrell Fortune. In addition, Royce Gracie’s nephew, Neiman Gracie (4-0), will challenge Rudy Bears (16-14) in a catchweight bout that will also be featured on the preliminary card. No Comments on "Bellator 163: McGeary vs Davis Weigh-In Results (photos)"